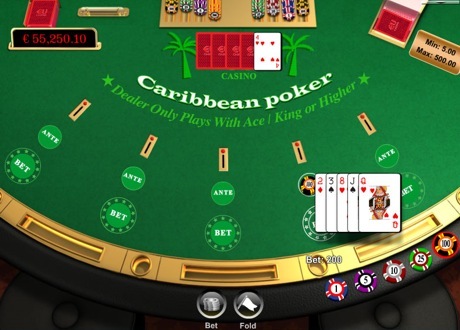 Caribbean Poker is a Poker-style game, in which the player competes against the dealer with hands formed from 5 cards. EUCasino's Caribbean Poker is played with a standard 52-card deck. To start the game, the player must place an "Ante Bet". The dealer then gives each player 5 cards face-up. The dealer also receives 5 cards; four cards dealt face down, and one card face up.